I'm annotating individual pages from my book Mom's Cancer as they're posted on GoComics.com. These are my notes on Page 18 (June 29). From time to time, people ask if pages from Mom's Cancer are available as prints or posters. (No, sorry.) This is almost always the page they're interested in. We used this image for the cloth bags given to participants of the 2011 Graphic Medicine Conference in Chicago (with, as I recall, a kind donation from my publisher Abrams to help pay for the bags). It depicts a long day at the hospital. The different colored backgrounds suggest that these exams are happening in a variety of times and places. Different tests, repeated tests, different docs and nurses. They also make a visually interesting checkerboard pattern. The day and the page begin with recognizably drawn features: hands, feet, arms, legs. As the day goes on, the features become less concrete. Everything becomes an exhausting abstract mush. By the time Mom's given the final command to "feel," it's impossible for her to feel anything. I'm surprised how strongly some people respond to this page. I think maybe I captured something many folks have felt but didn't quite know how to express. No, not the gambling kind . 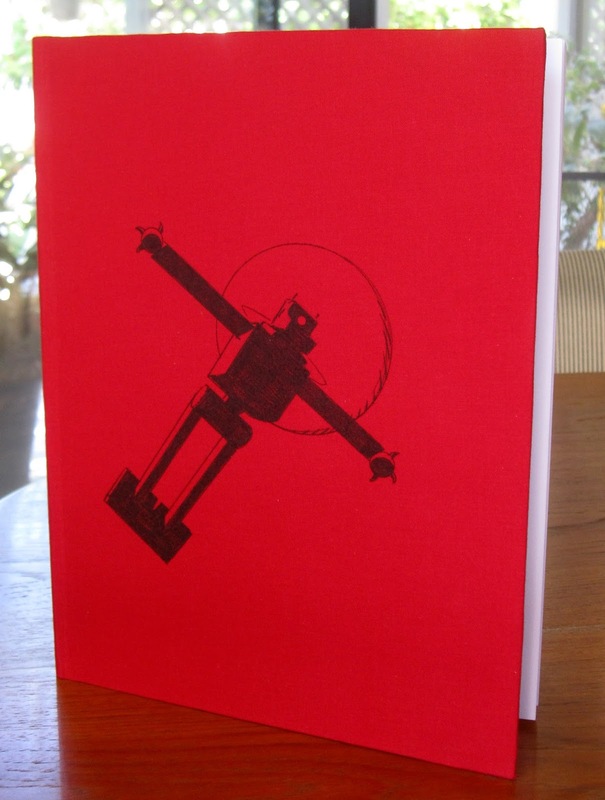 . .
My wife Karen had one birthday gift request for me: she wanted a hard copy of my webcomic "The Last Mechanical Monster." She'd only read it in installments online, and wanted to sit down and enjoy it all together. What she had in mind was a print-out of the pages, maybe slipped into a little binder or report cover. First I printed all the pages on good heavy paper, the type you'd use for a resume. I wanted to print on both sides without any bleed-through. I cut, scored and folded a piece of thick matte board to be the guts of the cover. First attempt at binding the pages. The pages are clamped in a homemade press to keep them lined up and tight. 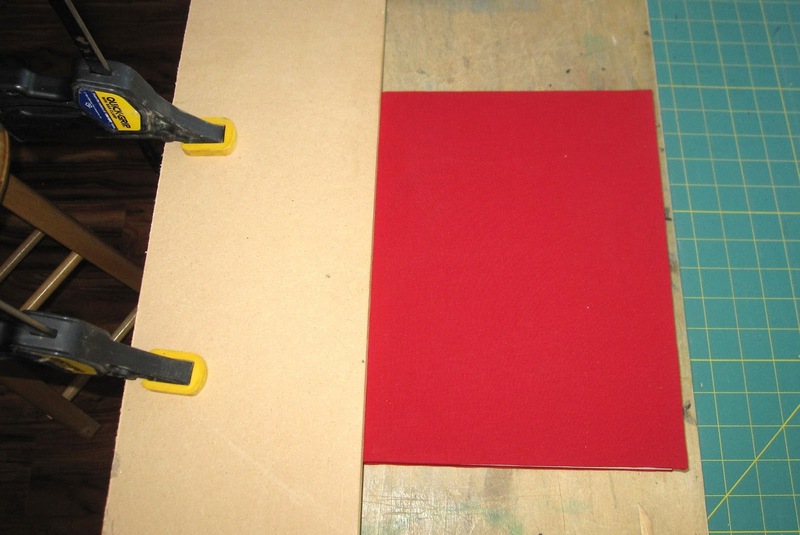 Many of the Internet bookbinding tutorials recommend using watered-down "Gorilla glue," which is meant for wood. Makes sense. The idea is that the glue soaks into the first quarter-inch of the pages and sticks them all together. While that dried, I worked on the cover. I found a nice red cloth remnant, ironed it (can't remember the last time I used an iron), and spray-glued it to the folded matte board. 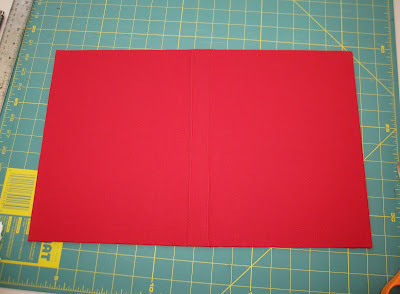 Things I learned: using diluted Gorilla glue warps the matte but spray adhesive works great, it's best if the cloth isn't stretchy, and the cloth has to be thin so that you can glue it down flat to the back (i.e., the inside covers). 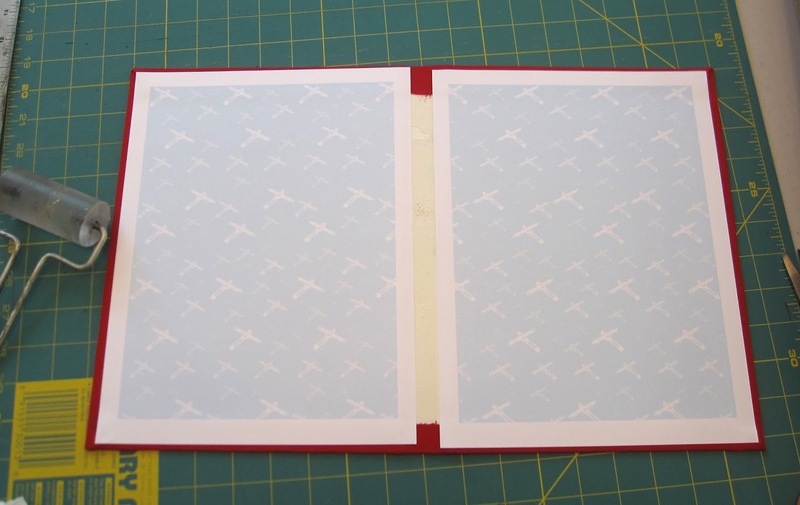 Flipped the cover over to glue down the fabric and apply the end papers, which are the light blue images of flying robots I used as a background for the webcomic. That's about when I figured out that the glued spine probably wouldn't hold up long term. It was OK, but I could imagine pages popping out pretty easily. 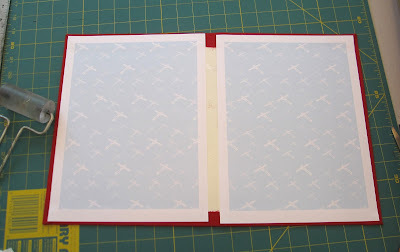 Initiated Plan B, which was to sew the pages together using the bookbinders' stitch. I was worried my drill press would tear up the pages when I drilled the holes, but it worked like a charm. Next I glued the sewn pages into the cover, creating a little crimp along the spine so that the front and back covers would attach up to the sewing holes before bending out. Clamped and let that dry for a couple of days. 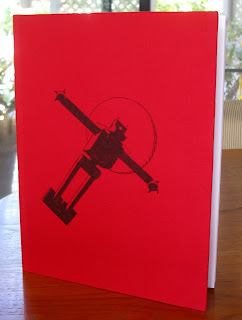 Last step: Drew a jaunty flying robot on the cover. Wrapped it up and gave it to Karen. She sat right down and started reading the book last night, so I guess it's a success. I know I didn't hew too closely to traditional bookbinding methods. A lot of this was "look at five things on the Internet and combine them into something that seems like it'll work." But I'm really happy with the result. It was fun! And it looks like a real book! I could see getting addicted to a cool craft like this. I'm looking forward to trying it again sometime. 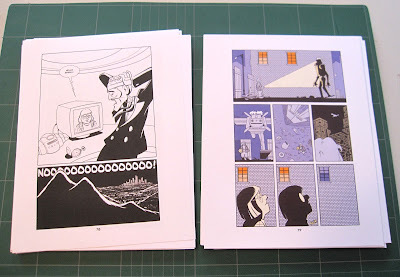 I'm annotating individual pages from my book Mom's Cancer as they're posted on GoComics.com. These are my notes on Pages 12 and 13 (June 8 and 11). This image of Mom as the character in the "Operation" board game often gets a strong reaction. It tends to be one of people's favorites or least favorites. 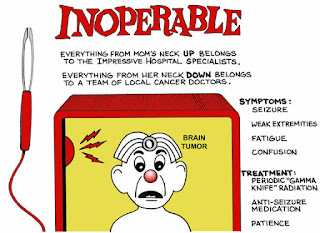 Occasionally people who haven't read a comic since "Little Dot" in 1966 accuse me of "making fun of my mother's illness," which couldn't be further from the truth--but I think this might be the sort of drawing that leads them to believe that. It does combine the deadly serious with the absurd, which was one of the points of Mom's Cancer. So much of the situation was absurd! I don't remember how I thought of using this iconography. I think I wanted to take a breath and summarize what Mom's condition was at this point. How to do that in a comic? 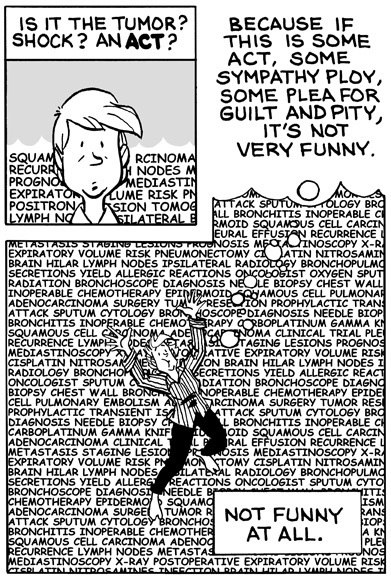 You can't just list symptoms and treatments with words, you need a way to show them. Diagrams, x-rays? Somewhere in that train of thought, the board game came to me. One thing I like about splitting the image into two pages is it naturally divides Mom's tumors, and therefore the treatments she received for them, between her head and her chest. Which is basically what happened: she had head doctors and chest doctors, and rarely did the twain meet. I never liked that solution--not least because I didn't want to get sued by Milton Bradley--but my problem was a simple one: I didn't want to draw my mother fat and naked! I don't know how long it took me to solve it by putting a medical dressing gown on her, but it was an embarrassingly long time. 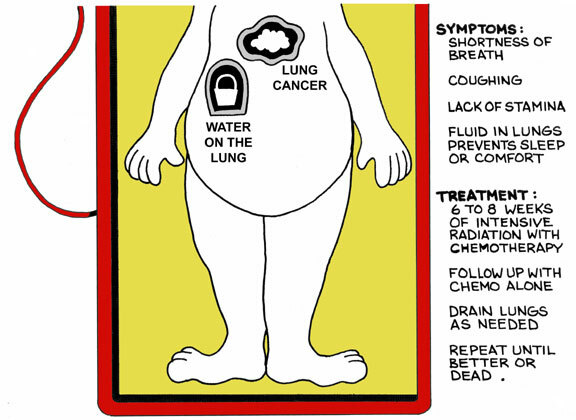 I'm annotating individual pages from my book Mom's Cancer as they're posted on GoComics.com. These are my notes on Page 11 (June 4). I could've sworn there was a beach ball. 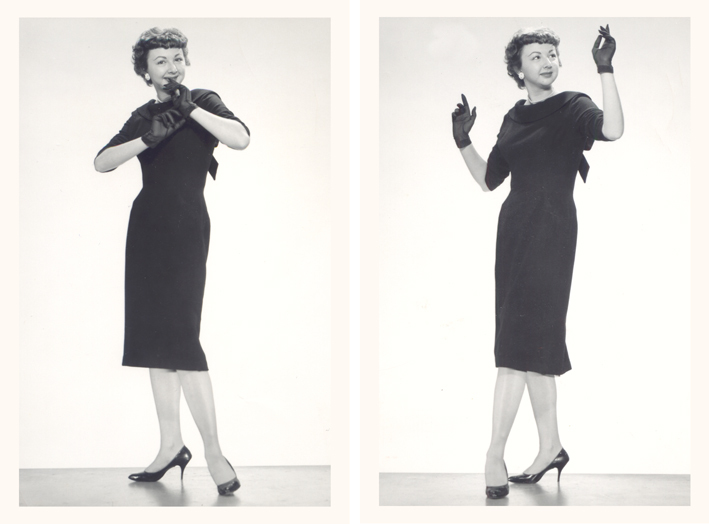 In case my asterisked footnote in the comic was too subtle, Mom worked as a model when she was 18 to 19. I was born shortly before she turned 20. 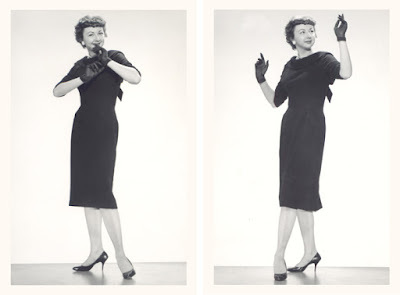 Having her papers and affairs in order was one of the best things Mom ever did for her family. 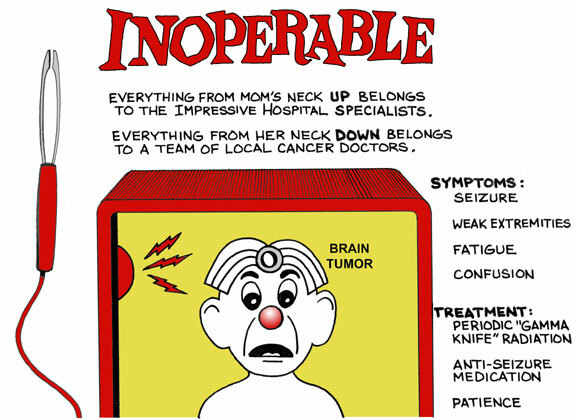 I'm annotating individual pages from my book Mom's Cancer as they're posted on GoComics.com. These are my notes on Page 10 (June 1). The panel of Mom drowning in a sea of medical jargon is one of the first and strongest (in my opinion) visual metaphors in Mom's Cancer. There'll be more later. A friend compared trying to absorb all the information rushing at you when you're suddenly seriously ill to drinking water from a fire hose. The ability to use this type of image is one of the reasons I decided comics was the right medium for telling my family's story. I think this is a good example of how a picture conveys more meaning than a thousand words could. You look at that and you instantly get it. I don't need to use the words "drowning," "overwhelmed," or "terrified" at all. It's a type of communication comics do uniquely well. Looking at this page today raises a couple of craft notes. First, I see I used the typeface "Comic Sans" for the words. Sorry about that. Back when I made this page I don't think it had acquired its infamous disrepute. Second, I wasn't yet comfortable with digital art tools. Pasting those words into the background behind my hand-drawn figures would've been a 10-second cinch in Photoshop. Instead, I printed out the words on paper, cut out the shapes of the figures with an Xacto knife, and rubber-cemented them to the original art! 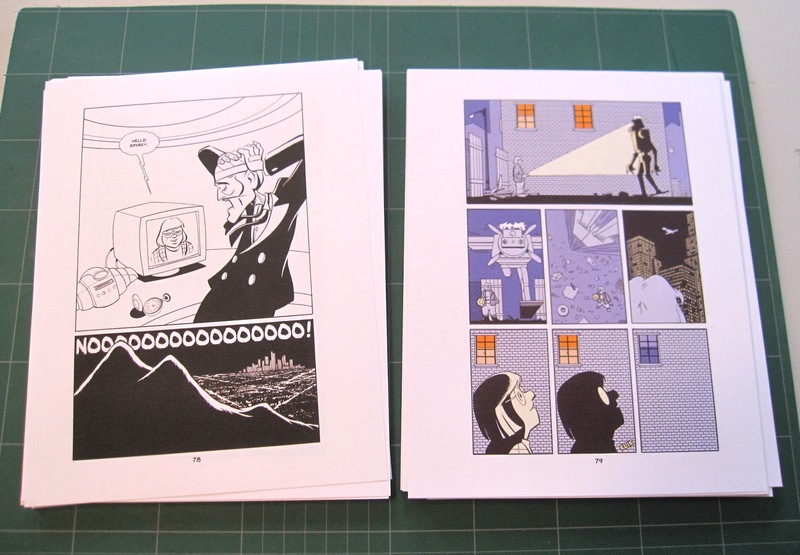 It looks OK in print but the original is a gluey mess. What a maroon! One nice surprise of reprinting Mom's Cancer on GoComics.com has been watching a little community of readers and commenters build. Some have been or are going through similar ordeals themselves. An unexpected hitch is that some readers who (very reasonably) don't know the history of Mom's Cancer seem to be under the impression the story is happening now. They offer me and my family advice. I don't want to ruin the story's immediacy by telling them "No need, it happened 10 years ago," nor interrupt the conversations to constantly correct people, but I don't want to give the wrong impression either. There's a fine line there I haven't figured out how to walk yet.